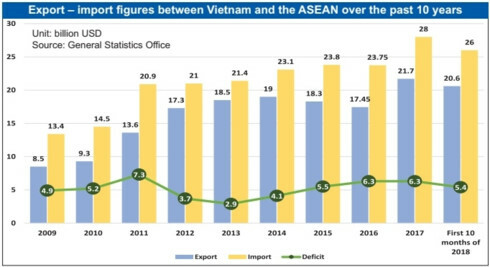 Ever since the ASEAN Economic Community was established at the end of 2015, businesses in Vietnam have been gradually capitalising on the bloc’s import tariff cuts to swell their exports, helping to narrow down an on-going trade deficit between Vietnam and other ASEAN markets. Phan Minh Thong, chairman and general director of agricultural producer and exporter Phuc Sinh Corporation, is pleased at the firm’s good performance within the Southeast Asian market. “We have greatly benefited in the region thanks to slashed imported tariffs under regional commitments,” Thong told VIR. In the first 10 months of the year, Phuc Sinh’s export turnover in Southeast Asia is about $3 million, up 20 per cent against 2017, and its import turnover is $5 million, up 50 per cent against last year. According to the General Statistics Office (GSO), agricultural products are just among many that have boosted Vietnamese exports to Southeast Asia since the ASEAN Economic Community (AEC) was established. The Ministry of Agriculture and Rural Development reported that in the first 10 months of 2018, Vietnam’s total export turnover of agro-forestry-aquatic products to the region hit $3.2 billion, up 34.4 per cent on-year, largely due to tariff cuts under the AEC. The GSO noted that Southeast Asia is now Vietnam’s fourth-largest export market after the US, the EU, and China. Vietnam’s export turnover to the region surged from less than $1 billion in 1995 to $18.23 billion in 2015. In 2016, Vietnam’s export turnover to Southeast Asian markets was $17.45 billion. However, the figure ascended to $21.7 billion last year. In the first 10 months of this year, the figure hit $20.6 billion, up 14.5 per cent on-year. Vietnam’s exports to other nearby nations have risen significantly, through both overseas and domestic enterprises. This is due to slashed import tariffs, in addition to increased awareness about Southeast Asian markets, according to the Ministry of Industry and Trade (MoIT). Key Vietnamese exports to Southeast Asia include farm produce, mobile phones, electronics, steel, machinery, vehicles, textiles and garments, and crude oil. Nguyen Huu Truong, sales representative of Vietnamese-Chinese joint venture Garmexi Trade JSC based in the northern province of Bac Giang, told VIR that if his firm directly exports its garments from China to Southeast Asia, it would face an average import tax rate of 8-10 per cent. However, from Vietnam it enjoys a far lower import tax rate of merely 2-3 per cent, which will be removed completely by the end of the year. In the first 10 months of 2018, Garmexi has exported to Malaysia and Singapore, with turnover increasing 20 per cent on-year. “We are planning to expand our exports to Thailand, Myanmar, the Philippines, and Indonesia in the future,” Truong said. Many of Garmexi’s peers already export their products to these key Southeast Asian countries. As one of the main pillars of the ASEAN, the AEC is aimed to create a tariff-free zone with 0 per cent tariffs on all traded goods and services, while setting a timetable for removal of non-tariff barriers regionwide. The ASEAN-6 nations - Brunei, Indonesia, Malaysia, the Philippines, Singapore, and Thailand - erased 99 per cent of their import tariff lines by 2010. Meanwhile, Cambodia, Laos, Myanmar, and Vietnam have removed 90 per cent of their lines so far. And this year, another 7 per cent of tariffs will be removed by Vietnam. These numbers mean 669 tariff lines will be reduced to zero by the end of 2018 for such products as automobiles and spare parts, motorbikes and parts, steel, wine, beer, plastics, and paper. The remaining 3 per cent, on sensitive agricultural items such as poultry, eggs, sectioned fruit, rice, processed meat, and sugar, must be reduced to 0 per cent after 2018.